[Premise 2:] Most people who ignore statistics of failure (designated as 'ignorers') are stupid. 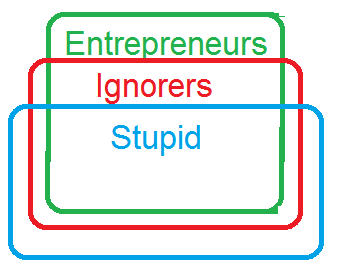 [Conclusion:] Therefore, most people who start businesses are stupid. I already understand, and so ask NOT about, refutation of the above by parallel reasoning (Prof Neta does this following the quote above, in the video). Instead, without appealing to refutation by parallel reasoning. please explain what's wrong with the above? I tried to depict the above, but my sketch below only supports the fallacy. Where are the problems? This is fallacious because we have no way of knowing the size of I. All we know from the premises is that most E are I and most I are S. For all we know, it could be the case that NO E are S.
Look at the following example. 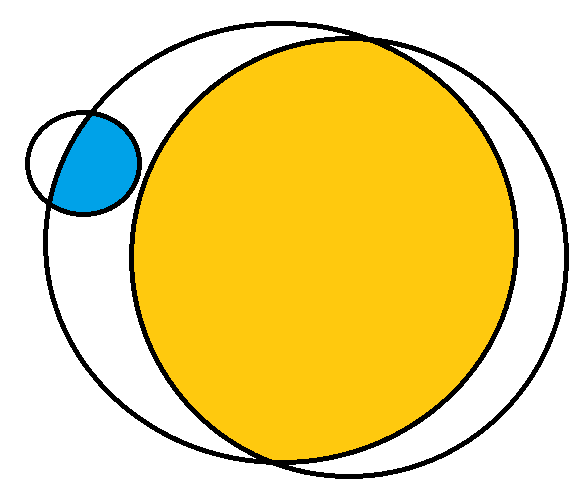 The small circle represents E, the middle one represents I, and the right-most one represents S. In E and I, more than 50% of the circles are filled by the next circle. Blue being all of the E that are I and Orange being all of the I that are S.
This is confirmed by the premises, but by no means proved. My depiction fits all of the criteria. Over 50% of the E group are also contained by I, and more than 50% of the I group are contained by S, however, none of the individuals in E are in S whatsoever. From the premises, you cannot conclude anything regarding the relationship between E and S as far as I know. It may be some, it may be most, it may be none, it may even be all; it's impossible to tell. I know this won't be the most typical approach to the matter, but I'll do from a probability (therefore mostly mathematical) point of view. What would P( S | E ) be? Which is that scenario? It's simply a scenario where everybody that's E and S is also I, which wouldn't contradict neither P1 nor P2. So, since we found a case where P1 and P2 are true, but C is false, we had demonstrated that the reasoning behind is fallacious.